Zombies getting shot out of cannons to wreak havoc upon the horrified masses below…this is what you get when you launch Freeverse’s Zombie Cannon Carnage. And a carnage it is, as you catapult and pinball your way through a city with a jet-pack that is fast running out of fuel (there’s an option to turn off the blood if you’re really that squeamish). 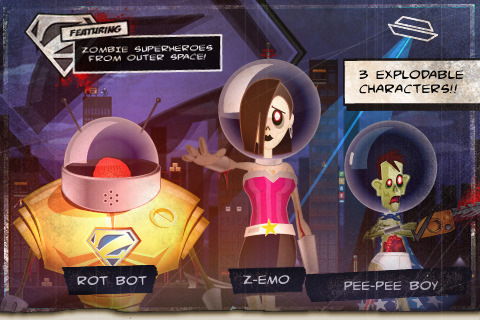 Your default zombie has the lovely moniker of Pee-Pee Boy (there are two other zombies to unlock), whom you launch through three different rounds in order to gain points and collect trophies. Point the cannon at the desired angle by dragging your finger across the screen, and tap to fire Pee-Pee Boy. Tap the Thrust button at the bottom right to activate the jet-pack, and tilt the iPhone to move him up or down (or to alter his gravity while in free-fall). Try to hit as many things in your way as possible, as each impact garners points. After the fuel runs out, you can hit the Self Destruct button to destroy things around you, even as you’re down for the count (when the light blinks, tap anywhere on the screen repeatedly to speed up the loading time). Of course, there are things to watch out for–police helicopters, ice cream trucks, the Air Force (don’t fly too high! )–as they will end your round immediately. You earn money with your points, with which you can upgrade your cannon or jet-pack, or obtain a Mystery object. The graphics of Zombie Cannon Carnage is hands-down the shining star of this game app, closely followed by the humor (and the music is pretty awesome, too); regrettably, the controls aren’t very intuitive and take some fiddling with to before becoming comfortable with them. From the comics-style loading screens to all the action during the game, everything is extremely detailed–unfortunately, the game runs by at such a fast pace that you simply can’t catch everything the first time around. This will probably be why you’ll keep playing the game even after you finish all three rounds…which are pretty short in and of themselves. It’s a shame that something so richly outfitted is lacking in this one (huge) aspect, because upon unlocking all the zombies and gathering all the trophies…what else is there to do? But if you’re a fan of stylized, campy horror humor with fast and explosive gameplay, then this $0.99 app will be for you. AppSafari review of Zombie Cannon Carnage was written by Julie Guan on March 4th, 2010 and categorized under App Store, Featured, Fun, Games. Page viewed 3548 times, 1 so far today. Need help on using these apps? Please read the Help Page.